The natural history of change in size of arachnoid cysts (ACs) is an unsettled issue. This leads to confusion in deciding treatment strategies of incidental, asymptomatic AC in children, since the risks and complications of surgery are not negligible. The aim of the present study was to elucidate the clinical significance of change in size of AC in young children. From 2000 to 2008, 86 patients younger than 5 years with AC documented on brain imaging were included. They were divided into four different age groups (group I: 0–0.5 year, group II: 0.5–1 year, group III: 1–3 years, group IV: 3–5 years). 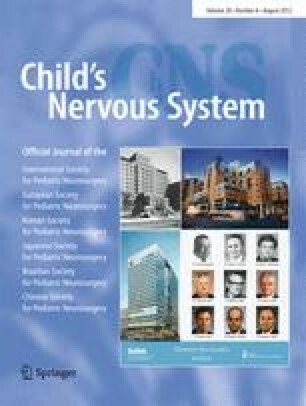 The temporal changes in size of the AC on consecutive ultrasonography, computed tomography (CT), or magnetic resonance imaging (MRI) of each patient were measured and plotted as individual graphs. Natural progression of AC size was assessed by evaluation of the pattern of each graph. Seventeen patients showed enlargement of AC during follow-up; 14 patients were younger than 1 year. None of the patients in group IV showed enlargement during follow-up. Overall, 11 of the 17 patients with demonstrated AC enlargement were not operated on. In six patients, AC enlargement ceased, and spontaneous regression was observed in three patients. The remaining two untreated patients had shown asymptomatic increase in size at last follow-up. Statistical analysis revealed age at diagnosis to be the only significant factor affecting cyst enlargement. Asymptomatic enlargement of AC in infants may not be an indication for surgical intervention. Close follow-up is a viable option for such children. This work was supported by a National Research Foundation of Korea (NRF) grant funded by the Korean government (MEST) (2011–0015960).